A ghost can be born of a terrible act. It tucks itself away in a victims head, undetected by the conciousness. Quietly haunting the darkest corners of the mind, until the day a thought is left to stray; unguarded. Latching on, gifting a slideshow of horrors then as quickly as it springs out, it goes. The aftermath; a familiar sickening fear that clings and blankets over good experiences. This ghost will steal precious time, happy memories and future if left unchecked. The struggle begins, innocence dealing with sin not its own; unfairly burdened. So even if that ghost lives, has a name, and breathes air; its all the same. Within, they are a ghost. That’s how it must be. Because even ghosts die if not fed. That’s how a life’s won back from the brink. Take revenge by loving yourself instead. 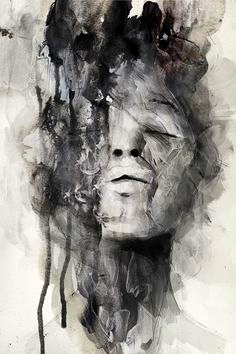 Art is a painting done by Januz Miralles. It was a metaphorical ghost. Lol I appreciate the hilarious scene that would be though. You attempting to beat down a ghost; semi tipsy. Us Brits will fight anything when we’re drunk. Up to and including their own shadow. That stereotype is actually over publicised as most drunk Brits aren’t that bad at all.